Ruby Christina Marles (née Aspeslet) - Edmonton's Burial & Cremation Professionals | Trinity Funeral Home Ltd.
Ruby Christina Marles (née Aspeslet), born July 16, 1925, died peacefully in her sleep on July 26, 2016. Ruby is survived by her husband of 70 years, John D. Marles, and four siblings, Sylvia, Iris, Douglas, and Nigel. John and Ruby were blessed with four children; David (deceased), Christine (Chuck), Cynthia (Bob), and Candace (Ben), as well as numerous grandchildren, and great-grandchildren. 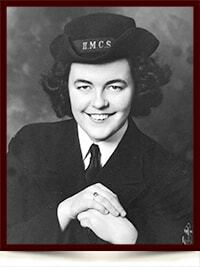 Ruby served in the Navy during WWII, reaching the rank of Leading Wren in the Women’s Royal Canadian Naval Service. Ruby was involved in the arts her entire life, as a painter, potter, spinner, weaver, teacher and author. Her greatest joys were her family, her wide circle of friends, and her numerous trips abroad with her beloved husband John. In lieu of flowers, the family suggests a donation to the charity of your choice. Dear Nigel and family we are thinking of you as we just read about the passing of Ruby/ we will always remember your kindness when Gerry passed away. We are sure Ruby will be missed.